The U.S. dairy industry’s growing portfolio, year-round supply, science-based research, and commitment and passionate farming can help customers innovate nutritious and delicious products. Events like the U.S. 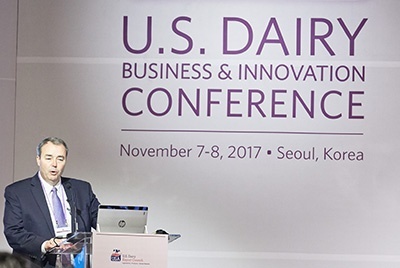 Dairy Business & Innovation Conference in Seoul, South Korea this week showcases U.S. dairy’s innovation and strong commitment to serve its global customers. USDEC senior leadership representatives: Building win-win relationships with customers in Korea is a top priority for the United States. As the U.S. dairy portfolio expands, Korea and other food and beverage markets around the world can meet demands expressed by their consumers. GlobalData trends analyst Neil Hendry: Several leading 2017 trends such as health and well-being, clean-eating, quick and easy solutions, experimental and eco-friendly/natural foods have a strong U.S. dairy link. U.S. dairy products and ingredients have qualities to replace unwanted ingredients for a label-friendly, attractive and versatile formulation. Nutritionist Leslie Bonci: Science-backed studies demonstrate the unique nutrition qualities of cheese and dairy proteins. These dairy products can be used in a wide variety of applications to support healthy and active lifestyles with convenient, age-appropriate consumption capabilities. Dairy innovation expert Kimberlee J. Burrington of the Wisconsin Center for Dairy Research: Latest comparative research findings on dairy versus non-dairy protein sources highlight dairy as one of the highest quality proteins available. This research reinforces the undeniable edge U.S. dairy proteins deliver in developing winning products, functionality and sensory. Chef Se-kyung An of Cooking Studio Plaisir Gourmand: Innovative recipes that show how U.S. whey protein and cheese can be integrated in healthful Korean-style recipes were showcased. One recipe was as salad dressings using U.S. whey proteins and another was a cheese sauce using Colby Jack and Parmesan cheeses. To give conference attendees a taste of the breadth of high quality U.S. cheeses, chef John Esser hosted a networking reception featuring cheese and beverage pairings. He guided attendees through dozens of delicious U.S. cheese varieties to demonstrate the variety of what the United States can offer foodservice professional and product developers. Customers worldwide can use the large variety of U.S. cheeses and high-quality proteins to offer delicious foods and beverages with health and wellness benefits in their countries. Visit ThinkUSAdairy.org for more resources.